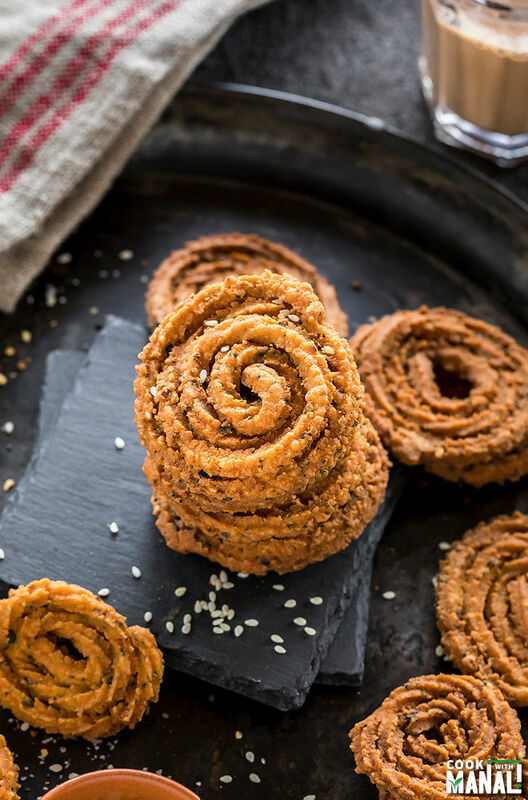 Crispy Instant Chakli made with rice flour – this is one of my favorite homemade savory treats for Diwali. Enjoy it with a cuppa chai! First thing first, my cookbook is out in the world today you guys! Eeeeks still feels surreal, so thankful for this journey and the opportunity!! Diwali will be here even before you realize. Can’t believe 2018 is also almost over, it is so crazy. My enthusiasm for celebrating Diwali has gone down a lot after mom’s death. I used to wait for Diwali all year long, it was my favorite festival. Houses decked up with lights, the positivity, lots of sweet, happiness, beautiful diyas, candles and rangoli – they all made Diwali so special for me. It’s not that I don’t like Diwali anymore, I guess I still do but the happiness and excitement that I felt from with in for the festival is now totally missing. It has become just another day for me. So much of me went with mom. While I try to stay happy and lead a normal life, few things have changed forever. Anyway I will still be making sweet and snacks for Diwali and of course I will be sharing lots of Diwali recipe with you guys in the coming weeks. 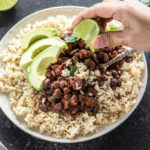 I thought of starting with a savory recipe this time. 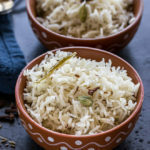 I know, I have tons of Diwali Sweets on the blog so maybe I should try and add more savory recipes. What do you guys say? 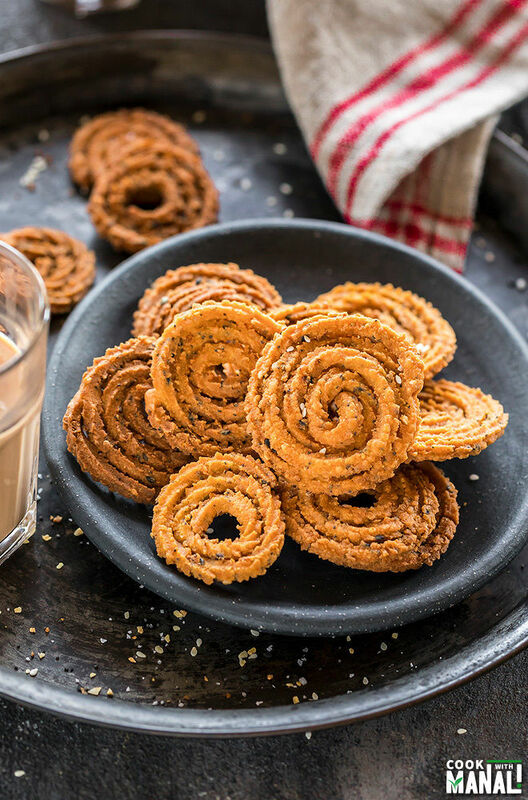 This Instant Chakli is one of my favorite snacks that you can easily make at home for Diwali. 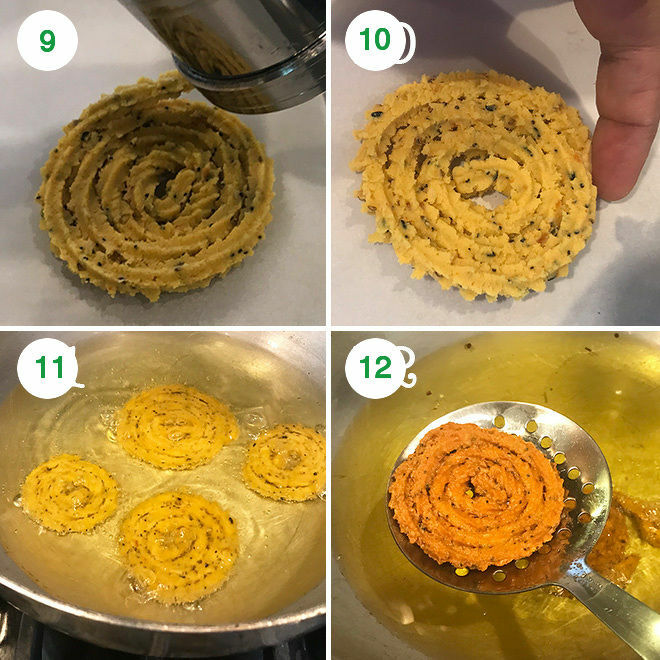 Chakli is a deep fried savory snack which is spiral in shape and is usually made with rice flour, chickpea flour or lentils like black gram (urad dal). There are different versions depending on the type of flour you use. A super close variant is known as murukku in South India. 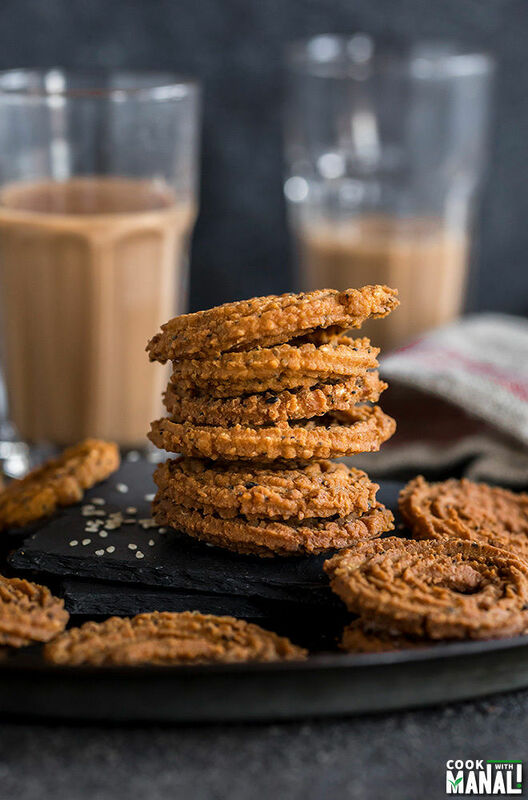 The version of chakli that I am sharing with you guys today in the instant version made with rice flour mixed with little besan (chickpea flour) and maida (all purpose flour). Making chakli at home is not difficult, it’s actually a pretty straight forward recipe. 1. First of all add some hot oil to the dough. This is extremely important for that crispy chakli. Mix the oil into the flour mix using your fingers. 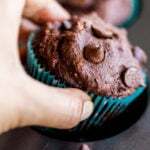 So basically rub it in using your fingers until the flour resembles crumbs. At this point take a small amount of the mixture and squeeze it between your palm. If it holds it’s shape and binds well, it means the oil was just enough. 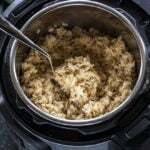 If it crumbles, means you need to add more oil. I learnt this from my house help in India. He is amazing at making all these Indian snacks and he taught me this. Once you follow this, you will never end up with soft and not-so-crispy chakli or mathri or namak para! 2. Let the dough rest for 20 to 30 minutes before you start making the chakli. The rest makes it easier to work with the dough. 3. Always remember to keep the heat to medium-low while frying the chaklis. Do not fry at high heat, they will not turn crispy. To test the temperature of the oil, always add a little piece of dough to the oil. If it comes up gradually, the oil is just right for frying. If it comes up super quickly, the oil is too hot. 4. Use a parchment paper to pipe the chaklis. It will make your life so much easier. 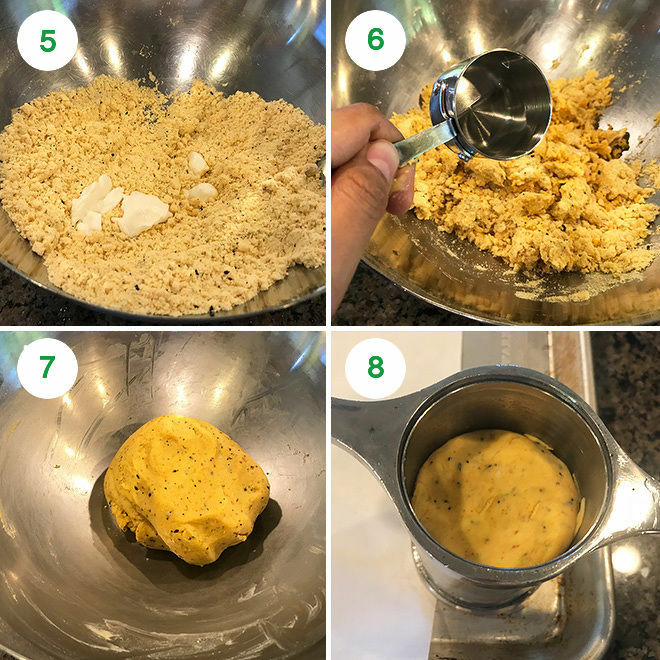 If you dough is breaking while forming the chakli, take it out of the chakli press, add a tablespoon of water at a time and knead again. 5. Seasoning is important! If you want to make it spicy, add more of red chili powder. 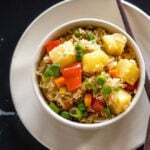 You can even add some minced green chilies. Sesame seeds are commonly used in chakli but here I used Trader Joe’s Everything But the Bagel Sesame Seasoning Blend. It’s a mix of white sesame seeds, black sesame seeds, poppy seeds, onion and garlic. I love it and put it on just about everything so I added it to the chakli as well. Turned out really well. 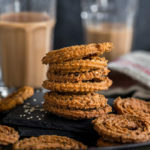 You would need a chakli press to make chaklis. They come with different tips, I used a simple star shaped tip to make these. You can find the press online or at Indian grocery stores. 1- In a large bowl mix together rice flour, besan (chickpea flour) and maida (all purpose flour). 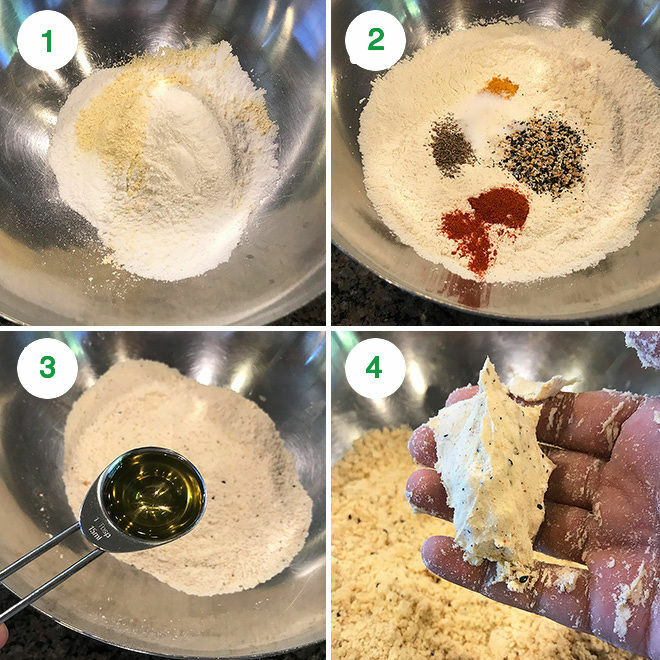 2- Add in the red chili powder, ajwain (carom seeds), turmeric powder, hing (asafetida), white sesame seeds (or a mix of seeds like I used Trader Joe’s Everything But Bagel Seasoning) and salt. Mix until well combined. 3- Add hot oil to the flour and rub in using your finger until flour mix resembles crumbs. 4- Press a bit of flour between your palm it should come together and not crumble. If it crumbles, means you need to add more oil. If it holds its shape and bind well, means the oil is just perfect. 5- Then add a tablespoon of plain yogurt and mix well. 6- Start adding water little by little to knead all of it to a smooth and soft dough. I used around 1/2 cup lukewarm water. 7- Cover the dough and let it rest for around 20 minutes. 8- After the dough has rested, grease the chakli press with oil and then add the dough into it. I used a star tip here. 9- Start piping the chakli on parchment paper. Press the dough using the chakli maker and form concentric circles. If dough is breaking add little more water, knead again and then try. 10- Snap the dough after you have have 3 to 4 spiral rounds. Seal the dough by pinching the ends. You may use little water to seal. Make all chaklis like this, keep them covered so that they don’t dry out. You will get around 20-25 chaklis. 11- Heat oil on medium heat in a kadai/wok. To check the temperature of oil, drop a piece of dough, it should come up gradually. If it comes up too quickly quickly- the oil is too hot and your chaklis won’t turn crispy. Add chaklis to the oil, one at a time. and do not over crowd the kadai. Fry in batches of 4 to 5. 12- Fry on medium heat until the chakli turns golden brown in color. Remove from oil and drain on paper towel. Let the chakli cool completely and then store in air tight container. Enjoy with chai! 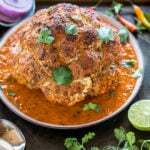 If you’ve tried this Instant Chakli Recipes then don’t forget to rate the recipe! You can also follow me on Facebook, Instagram to see what’s latest in my kitchen! Instant Chakli made with rice flour. 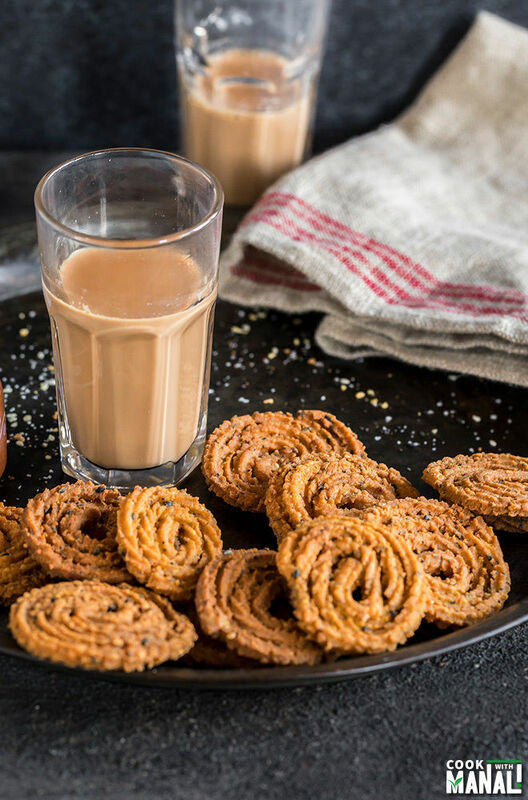 This popular Indian snack is crispy, crunchy and best enjoyed with a cuppa chai! 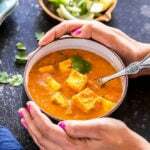 In a large bowl mix together rice flour, besan (chickpea flour) and maida (all purpose flour). Add in the red chili powder, ajwain (carom seeds), turmeric powder, hing (asafetida), white sesame seeds (or a mix of seeds like I used Trader Joe's Everything But Bagel Seasoning) and salt. Mix until well combined. Add hot oil to the flour and rub in using your finger until flour mix resembles crumbs. Press a bit of flour between your palm it should come together and not crumble. If it crumbles, means you need to add more oil. If it holds its shape and bind well, means the oil is just perfect. Then add a tablespoon of plain yogurt and mix well. Start adding water little by little to knead all of it to a smooth and soft dough. I used around 1/2 cup lukewarm water. Cover the dough and let it rest for around 20 minutes. After the dough has rested, grease the chakli press with oil and then add the dough into it. I used a star tip to pipe the chakli. Start piping the chakli on parchment paper. Press the dough using the chakli maker and form concentric circles. If dough is breaking add little more water, knead again and then try. Snap the dough after you have have 3-4 spiral rounds. Seal the dough by pinching the ends. You may use little water to seal. Make all chaklis like this, keep them covered so that they don't dry out. You will get around 20-25 chaklis. Heat oil on medium heat in a kadai/wok. To check the temperature of oil, drop a piece of dough, it should come up gradually. If it comes up too quickly quickly- the oil is too hot and your chaklis won't turn crispy. Fry on medium heat until the chakli turns golden brown in color. Looks like a fun treat! Bet they are addictive!